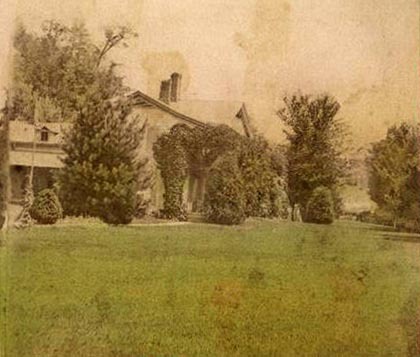 Mary Ann Crozer, the widowed sister of William Pryor Letchworth, came to live at the Glen Iris a few years after the death of her second husband, Edward Hance Crozer. She was 61, six years older than her brother William, when she arrived at Portage. Thankfully she kept a diary that is now part of the collection at the Museum in the park. Below are excerpts from the Crozer Diary beginning with Wednesday, May 9, 1877, when Mary Anne first moved to the present day Inn. She remained at the Glen Iris until her death on November 23, 1893. The Diary provides a glimpse of life at the Glen Iris in that era. We have also provided a partial "Cast of Characters" which may help the reader. It is found at the bottom of the page. The Glen Iris about the time Mary Anne Crozer arrived. "Came to Portage. Lillie and myself on May 9th. Left Auburn on Tuesday, May 8th at noon. Came to Buffalo and remained all night. Brother William met us there and we came home with him. Mr. Granger meeting us in the large carriage at Castile. Ella Smith met us at the Glen. She is staying with her uncle. Thursday spent the day in looking about to see what needs doing in the house and about the grounds. It is very pleasant here. I wonder if a home feeling will come to me. Friday, 11th. Brother William left us early this morning for Batavia. Some of my goods came and while moving a bedstead to lay my carpet some part of it fell and bruised my foot ­ which caused me much suffering. The wild flowers are beautiful about here and now I cannot gather them. I must stay in the house and heal my foot. Cousin Lillie is such a comfort to me. Saturday. Attended to some household matters. Unpacked some goods and arranged our rooms. Ogden and Anna Letchworth came to us this afternoon about 6 o'clock. Brother Wm returned about 9 o'clock this evening. It is pleasant to have them all with us tonight. More of a home feeling comes to me I think. Sunday 13th. After breakfast had a lovely reading in the library. Wm reading a chapter in the bible and Ogden reading a sermon. Anna reading hymn. Then the young people took a ramble in the woods to gather wild flowers. A fire was discovered near the Portage bridge. Wm and his men were obligated to attend to it immediately for fear of damage. The weather is dry - everything would burn very rapidly if left. Monday 14th. Ogden, Anne and Lillie left this forenoon for Buffalo. We waved our white apron and handkerchief to them as they crossed the bridge. Brother Wm left us on the early train for Batavia. Our things have been unpacked and we have put some of them in their places. It has been a warm spring day. So lovely. We have not been as lonely as we expected. Being busy is a good anti of loneliness. I think we both feel more and more as if we will enjoy this home.. Had two nice letters. One from sister Hanna and the other from sister Lottie Smith. We saw a carriage with three strangers, 2 ladies and 1 gentleman, they were on the lawn. New moon seen this evening. How lovely it looks. Tuesday 15th Warm day. How rapidly the foliage has come out . Seen two ladies, strangers, on the lawn. Cut asparagus this morning and sent some to Mrs Davis by brother Wms request. Had 2 nice letters. One from Cousins Ginny and Bessie and the other from our own dear Lottie Smith. Had a surprise about 6 o'clock. Brother George came walking across the lawn with his (unreadable) twins with flowers. Lillie and he have gone for a walk. How good of him to come and stay all night with us. This afternoon Mr G used the lawn mower for the first, It is quite an instrumentation. Wednesday 16th Brother G left us this morning soon after John Shanks, an old indian called. Brought some Indian relics. We gave him breakfast and he took dinner with the Mr Granger and departed. Saw two strangers on the lawn today. Have been cleaning house a little. Am alone tonight. Had a letter from Brother Wm from Batavia. A peddler called with house wares - I invested in a bottle of bluing and some scouring materials. Thursday 17th Had lovely little showers which have brought forth vegetation wonderfully. The moonlight is beautiful. I am not feeling very well , tired I guess. Had a nice letter from sister Hannah. Cherry trees in bloom. Cleaned the small dining room. Saw (?) Persons on the lawn. Friday 18th Had a busy day. Expected Lottie L but she has gone to Sherwood instead of coming to us. The weather is very warm. Saw 6 persons on the lawn today. Saturday - Lovely day Ginny Howland and Emily came down this afternoon. This evening Brother Wm returned accompanied by Mr Carman. No strangers about that we have seen. Heavy storms through the north and east but so far we have escaped. Received letters from brother George, sister Hannah and Lottie. Sunday 20th Another Sabbath Day has past. Our busy brother has so many duties to perform I sometimes fear it will wear him out. It is pleasant to see a child as happy as little Emily - she is a good child too. I think we all have enjoyed the day very much. Monday 21st Ginny and Emily left us this morning in the rain. They went to Castile. Brother Wm and Mr Carman left on the very early train so we are quite alone today. The sun came out about 10 o'clock and it has been so lovely ever since the little rain. Toward evening Lillie and I had a little walk. 3 ladies and 1 gentleman seated themselves on the bank in front of the house and all seemed to have a merry time. Tuesday 22nd A rainy day. But we are glad to see it. How it freshens everything up. Johnny planted our flower seeds this morning. No one been seen on the lawn today. Sky cleared about 5 o'clock this pm and this moonlight is perfectly gorgeous. Received a letter from sister L Smith which cheers our hearts. Saturday 26th. Busy day with us all. Brother George came from Buffalo bringing Nelson Hall(?) With him. It is Brother Wms birthday and the young people made quite merry over it ­ decorating the table with flowers and in the evening we sat around the fire telling stories until late. How cheerful the bright wood fire in the dining room looks." Thus it seems that her diary was full of the coming and goings of Mr Letchworth, family members and friends plus the noting of persons on the lawn, which seemed to be taken in stride by Mrs. Crozer. Comments on the weather are also a very common thread through the diary. Click Here for a further look at the Crozer Diary. "Sister Lottie Smith" - Charlotte Letchworth ( b 1832 - d 1890) who married Byron Clark Smith.